Sun Requirements: Full to partial shade. Soil requirements: Moisture-retentive, acidic soil. If you need to add some pizzazz to your shade garden, astilbe should be at the top of your planting list. It’s one of the most popular perennials in America today. Why? Because it’s a great, colorful performer that’s able to not only take the shade, but thrive in a moist garden year after year. Whether astilbe is already on your planting list, or whether it isn’t, here’s some hows and whys about astilbes you should know. There may not be a more colorful perennial than astilbe. In fact, Spring Hill’s Amethyst Astilbe’s lavender color is a breakthrough that changes shades in the fall. Couple that with the fact it prefers to grow in shaded areas and you’ve got yourself a lively addition to your yard or garden, and one that will come back year after year. Astilbes have fern-like foliage, so it goes without saying they can be planted with ferns. But they also make good companion plants for hostas and irises, especially texturally. These dependable, reliable plants also attract hummingbirds to your garden, so not only do you have a great-looking companion plant, you’ll have beautiful wildlife visiting your garden. Perhaps the best feature, though, of the astilbe is its carefree nature. As was mentioned earlier, virtually no pruning is required. Don’t worry about winterizing, either—astilbes don’t need any special treatment, making this an easy-to-grow perennial that fits into every garden. Add organic matter to the soil to buffer alkalinity and promote drainage: this plant prefers moisture-retentive soil, but won't thrive in soggy conditions. The plant prefers acidic soil, and may yellow if exposed to too much alkalinity. 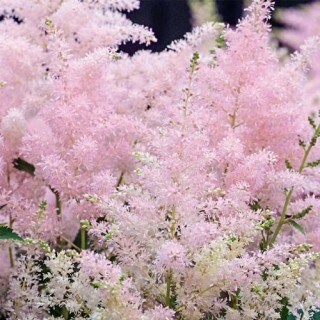 Plant astilbe 18 to 24 inches apart, and water in well. While astilbes prefer to grow in shaded areas, they’re capable of growing in moderate sunlight if they’re watered often. It’s important to note astilbes should be watered heavily once a week, as opposed to lightly every couple days. Astilbes love moisture, but they needn’t be drowned, which means the soil you choose to plant in must drain well. Astilbes can be planted in spring or fall, and need to be fertilized and mulched all season long. Cut them back in the spring. You can also divide the plant (digging a piece out with a shovel) in early spring or fall, but not before the third year. Dividing your astilbes is healthy for the plant and encourages growth, and divided plants will look exactly like the original plant. Astilbes look best when planted in the ground, usually along a border or in a garden bed. They’re not a particularly common container plant, but they look just as good in a vase as they do in your garden. No pruning is needed except to remove spent flower stems if desired, or you can leave them on for interest the rest of the growing season.